Chinese vehicle maker, BYD, has taken advantage of PPG waterborne coatings featuring patented ANDARO® pigments to create a brilliant finish on its new models at Auto Shanghai 2017. When it came to putting an eye-catching finishing touch on its latest concept cars, the ‘Dynasty’ and the ‘Song 7’, BYD called on the expertise of PPG’s Colour Styling Team. 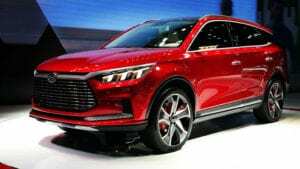 It was all about providing a rich, vibrant look and strong visual appeal to BYD’s vehicles to help encourage interest from show visitors, says David Cui, PPG Product Manager and Market Development Director, Automotive Coatings, Asia Pacific. Drawing inspiration from PPG’s 2020 automotive colour palette, the PPG Colour Styling Team utilised PPG’s patented, high-chroma ANDARO® nano-pigment tint dispersion technology to create colours with the high chromaticity requested by BYD’s design team. In order to match the Dynasty concept vehicle’s dragon-inspired exterior which draws on China’s rich cultural heritage, the PPG Team developed ‘Emperor Red’ – an intense red with high colour saturation. 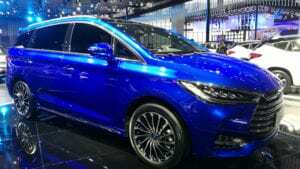 BYD’s long-anticipated seven-seat Song 7 model also incorporated a multi-layer paint finish, incorporating blue Andaro pigment, to deliver a brilliant appearance.